All three of the new book art galleries just published here share a common theme that has run through my work for almost a decade: the Old European script variously called the Vinca script, the Danube script, or by Marija Gimbutas, the Sacred Script (this page in the Library just updated with the full article and images, as well as the PDF download). 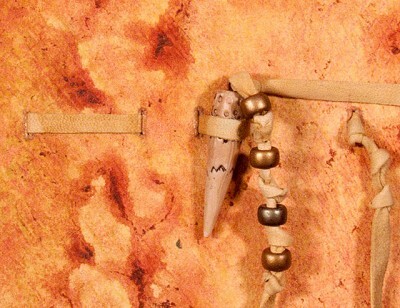 Because the marks were most often found on ritual objects – small vessels, spindle whorls, small female figures, altar tables – she surmised that their use arose from the maker’s desire to make these marks to effect a kind of magic, an invocation or prayer. I’ve returned to this mine of images and research again and again since discovering Gimbutas’ category of marks in her 1991 groundbreaking book The Civilization of the Goddess. I made a Roman majuscule alphabet inspired by these symbols, some taken directly from ancient artifacts, and some imagined. These glyphs were the subject of my first limited edition book, The First Writing, which was created from scans of the original book, shown in a new gallery here, in 2004. 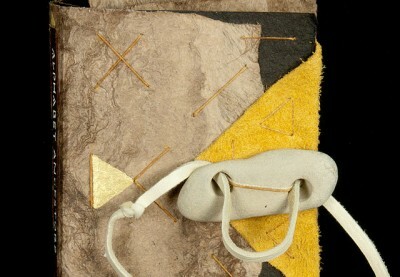 Above is a detail of the leather strap and loop closure I devised with a conical bead made by an artist friend of mine. 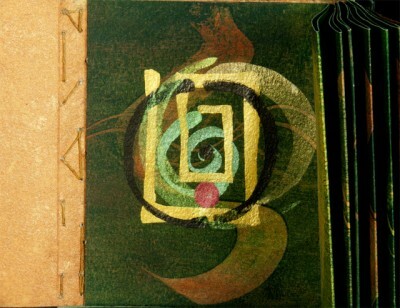 In 2007 I revisited these glyphs in two variants of small abecedaries called A Goddess Alphabet. 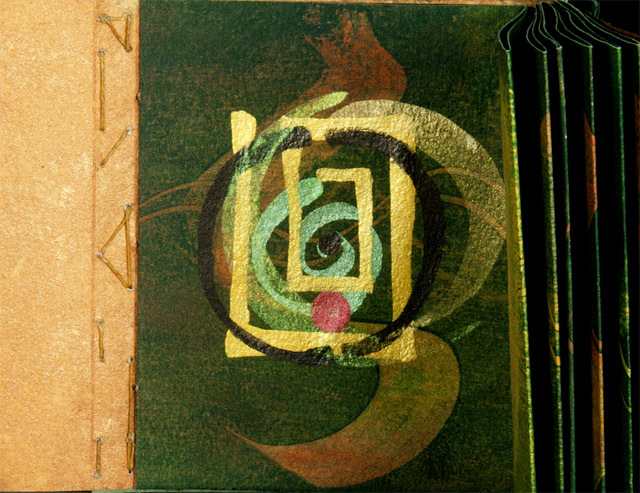 Again using the accordion format, I layered many versions of each letter in different colors of opaque and iridescent inks onto paste painted paper, wrapped them in decorated paper and stitched them into leather covers. One remains in my personal collection, and sometimes goes out a-visiting on exhibit when abecedaries are called for. In 2009 I made a series of three books, Alphabet Ancestors, which varied the accordion fold by making it continually fold outward, juxtaposing the ancient marks next to modern Roman letters. This year I finally combined all three variants of Alphabet Ancestors, illustrating 18 of our 26 letters, into a wraparound case made from Mexican bark paper, Cave paper and deerskin leather. The wraparound case is bound with a long leather strap and a stone conveniently offering two holes which I used to sew it to the cover like a big button. I sensed wanting to weigh the little stack of books with a stone, as if the letters in them were just as real as the stone, as full of meaning and substance. Here you can see a behind-the-stone look at the attachment process. I didn’t use the leather thong to do the sewing – that would have made much too big a hole in the cover – so I sewed it securely on – it’s fairly lightweight – with waxed linen thread, and covered the stitching with the leather thong with a knot at the end, to serve as the point of wrap-around. I enjoy working with these materials, especially leather, stone, feather, shell and bead. They feel fine in the hand, soft and of the earth. Some of these materials I buy at the Indian powwow when it comes through once a year, and hoard my deerskin for special projects such as these. Some, like the stone, just come to me, from where I don’t know or don’t remember. It doesn’t matter, it is of the earth and is given me as a gift for my creations.